In the fast-paced care management profession, change is continuous. Being successful in taking on new challenges while balancing current workloads requires creativity and innovation. The one-day Innovation course has been created to introduce innovation to care managers, define all the elements of creative work, and give you tools for introducing innovation to your care management team. How does a care manager infuse creativity, creative intelligence, and innovation into their team? This portion of the program will define the characteristics and phases of innovation that leader will need to model for introducing innovation to a care management team. You will also focus on discovering innovative talent in your individual staff members as well as in work teams to help you cultivate and operationalize innovation for maximum outcomes. In addition to internal innovation, a care manager or case manager needs skills for managing and enhancing innovation externally. Participants will learn how to evaluate the external environment, understand how to maintain connection with clients, customers, and other stakeholders for improved innovation, and create strategies for competitive advantages using innovation. We know that children have an innate passion for learning and discovery; as adults, we too are constantly engaging in our environment and learning, even when we are not aware of it. In the Education portion of the program, you will maximize your staff’s development by first gaining an understanding of motivation as described by researchers, studies, and case examples and will explore how to establish an environment that encourages discovery, thinking and innovation. Various learning “styles” will be covered, with examples of how to discern your staff’s learning style and how to enhance understanding within your team of each other’s styles. 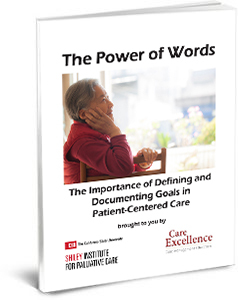 Finally, you will learn effective, highly innovative ways to help your care managers maximize their potential by understanding and using their own learning style. Case management is a profession of collaboration across disciplines. The study of innovation up to this point is offered to help care managers assure stainability and improvement of quality services. The Leadership Series concludes with a focus on innovative collaboration, critical for evolution of care services along-side a foundation of patient-centered care. In this section you will learn the definition of innovative collaboration and why it is important, cover idea generation, identify goals for innovative collaboration, and zero in on the benefits and the barriers of innovative collaboration. Tools for overcoming barriers to innovative collaboration, styles of this collaboration with their advantages and disadvantages, will segue into learning tools for collaboratively developing innovative resources. You will conclude with best practices for maximizing outcomes to obtain sustainable, essential resources from your efforts in a care management environment. Innovation has been pre-approved by the Commission for Case Manager Certification (CCMC) to provide 8 hours continuing education credit to Certified Case Managers (CCMs). Innovation consists of one day of face-to-face training, covering its three modules of lecture and interactive learning. Below are some Fast Facts about this course and its modules. Please call us for more information. Is taught: Face-to-face with participants in one-day session. Begins: When scheduled at your facility. Costs: Determined within scope of contract. Call 760-750-7285 to learn more. 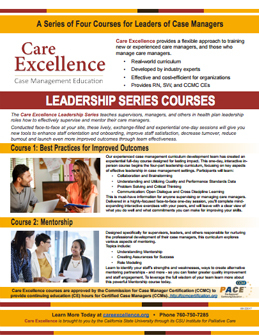 Is ideal for: Supervisors, managers, mentors, and others in health plan leadership roles who supervise or mentor case management team members, such as care managers and care coordinators, new graduate and/or experienced care managers. Provides: 7 nursing, social work and case management (CCM) continuing education hours upon successful completion of the one-day course. Refund Policy: Refund or substitution policies will be delineated at the time of contracting.